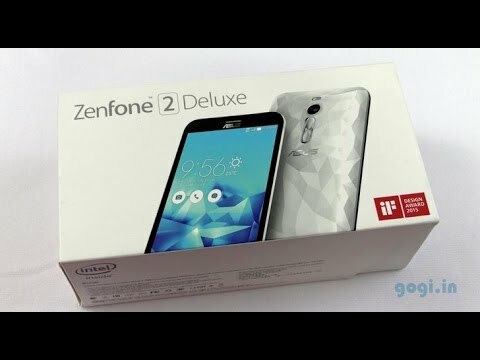 If you own Asus ZenFone 2 Deluxe, please do leave your feedback too. Asus had launched the Zenfone 2 which was their flagship smartphone. The Zenfone Deluxe is quite similar to the Zenfone 2 in terms of specifications. The difference with the deluxe is the unique back panel on the phone . The Zenfone 2 Deluxe has a unique back panel with different patterns to chose from. The phone has a 5.5 inch display with a resolution of 1920x1080 pixels. The display has a pixel density of 401 PPI and is an IPS panel. The phone has an Intel Z3580 Quad Core processor which is clocked at 2.3Ghz and the device has 4GB of RAM onboard. The Zenfone 2 Deluxe comes with Android Lollipop with Asus ZenUI loaded on top of it. The phone come with a lot of Apps from Asus. The phone also has gestures that can be used to wake the phone down on launch apps directly when the screen is off. The Zenfone 2 Deluxe gets 64GB of storage and gets a MicroSD slot which supports another 64GB expansion. The camera on the back is a 13 megapixel sensor and has a dual tone LED flash at just below it. The volume buttons are located just below the camera. On the front the Deluxe has a 5 megapixel camera for selfies. Asus had done some very good customizations in the camera. The phone has a non removable 3000mAh battery that can help the phone last for one full day. The phone supports 4G connectivity on the first SIM while the second one is restricted to 2G use.